Guests of The Regent Suite aboard Seven Seas Splendor will enjoy unlimited spa treatments, private dining room access, as well as gorgeous views from a glass-enclosed solarium. Sunset views from the spa. 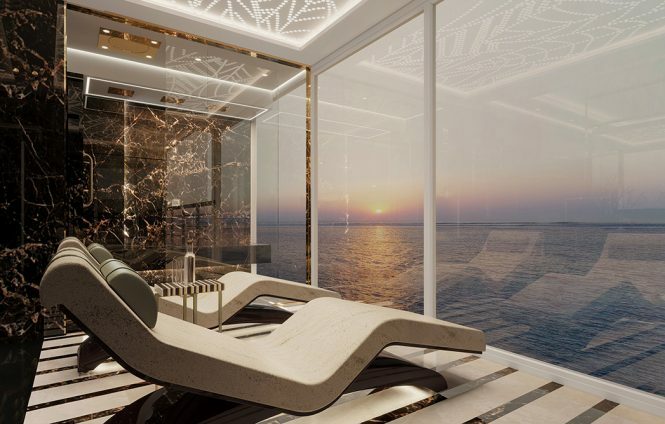 When Seven Seas Splendor sets sail in February 2020, it will be home to the largest suite ever built on a luxury cruise ship. To put it things in perspective, the 412-square-meter Regent Suite is a one-of-a-kind accommodation that’s about 20 times larger than the average cruise ship stateroom and said to be nearly twice as large as the average American home. For an all-inclusive price tag of US$11,000 per night based on double occupancy, guests will enjoy a palatial suite that doubles as a spa retreat. Inside, there’s an Italian marble- and stone-adorned spa treatment room with gilded gold accents, featuring a full sauna, heated relaxation loungers, and a multi-jet shower. And did we mention, these lucky guests are also entitled to unlimited complimentary in-suite spa treatments? Built on the 14thdeck, the suite boasts 270-degree views over the bow, as well as a glass-enclosed solarium where they can marvel at each destination’s beauty as the ship arrives into port. Alternatively, guests can lounge in a custom-made Treesse mini pool spa on the front balcony while admiring the sunset. Ensuring more than a good night’s rest, the suite’s centerpiece is a custom-made US$200,000 Vividus bed from the Hästens brand, built by master artisans over 300 hours. A separate sitting area in the master bedroom features a sofa and large flat-screen 4K ultra high-definition television. Other facilities include a walk-in closet and private balcony. Accommodating up to six guests in total, the suite features a grand living area designed with exotic woods, handcrafted furnishings, Italian marble, and golden chandeliers. Conceived by Tillberg Design of Sweden, the suite is also decorated with curated sculptures and paintings. Another perk? Exclusive access to an additional private dining room every evening in The Study located on Deck 11, where you can entertain guests or savor fine dining cuisine from the Prime 7 steakhouse or modern French restaurant, Chartreuse. Aside from having a dedicated butler onboard, as well as a personal car with a driver and a guide in every port, guests will also enjoy the services of a pre-voyage concierge who will take care of their every need even before they embark on their journey. If all that sounds appealing to you, be sure to plan ahead as the Regent Suite is already sold out for nearly all of Seven Seas Spendor’s 2020 inaugural season sailings.